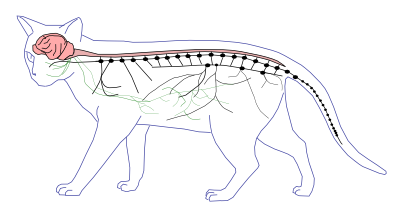 The nervous system lets the animals to communicate with the outside environment, as well as with their own body. From outside, animals fetch information through the sense organs (eyes, taste buttons, olfactory epithelium, sensory nervous terminals of the integument sensible to touch and temperature). It is remarkable that the main type of response of the nervous system to stimuli is through muscle contraction, i.e. movements. Although other responses are possible, such as releasing hormones. The ability of awareness, thinking, feelings, emotions, and all those features regarded as human superior features are caused by the activity of the nervous system. These human features, probably also present in some animals at a different level, are not strictly related to the outside world or the state of the body. The encephalon, part of the central nervous system, is regarded as the most complex organ of the animal kingdom, and some authors suggest that understanding the detailed mechanisms that make the encephalon works is one of the main challenges, not just for biology, but for science as a whole. 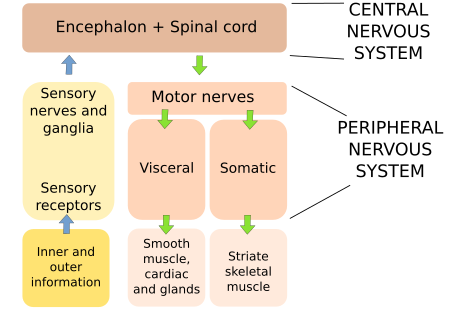 Subdivisons of the nervous system of vertebrates. (modified from Purves et al., 2007). The nervous system is made up of neurons and glial cells. Although neurons receive more attention, glial cells are indispensable. There are around 86000 millions neurons in the human encephalon, and the number of glial cells is even higher. Neurons communicate between each other mainly by synapses. A neuron may send information to thousands of neurons via synapses, whereas the same neuron may receive information from thousands of other different neurons. Furthermore, the type of information interchanged between neurons is diverse (neurotransmitters and others) and the effect of the same signal in a target neuron may produce different responses depending of the type of receptors and the particular physiological state of that neuron at that moment (transduction cascade). With these numbers in mind, and the complex communication process between neurons, it is easy to picture that the understanding of how the nervous system works is an enormous challenge for neurobiologists. The two main components of the nervous system are the central nervous system (brownish) and the peripheral nervous system (black and green). Traditionally, the nervous system has been divided in central and peripheral nervous systems. The central nervous system contains the encephalon (brain) and the spinal cord. The peripheral nervous system is composed of many neurons, usually as small groups and plexuses, which are distributed through the body. Purves D. 2007. Neuroscience. 4ª edición. Sinauer Associates, Inc.